Yesterday was the annual Nathan's Famous 4th of July Hot Dog Eating Contest in New York. The winner of the men's competition - yes, there are separate contests for men and women, which I find sexist because I've seen some women eat and they can totally pig out with the boys - was Joey "Jaws" Chestnut, who ate 68 goddamn hot dogs in 10 minutes. That's about 20,000 calories, in case you're interested. 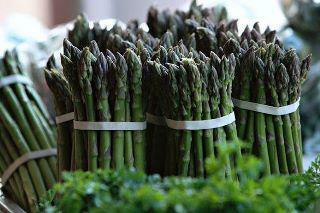 Or 5,000 asparagus spears without Hollandaise sauce. That's art, that's what that is. 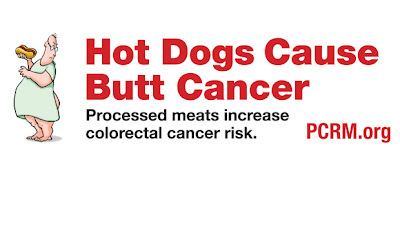 By the way, hot dogs can kill you. 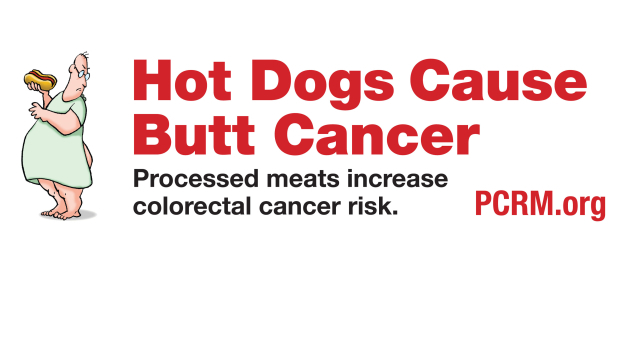 That's the message of the Physicians Committee for Responsible Medicine, which earlier this year explained the health risks of eating too many wieners in a series of billboards in Chicago. Looking at the picture of Joey Chestnut again, he doesn't seem too concerned about malignant growths in his colon. He's probably just thinking Om nom nom eat more wieners. When you're the hot dog eating champ and world record holder, you can't spend too much time thinking about cancer or how millions of children go hungry every day while you just ate a week's worth of food in 10 minutes. Anyway, both of these images are pretty awesome. Since I couldn't pick a favorite, I thought I'd post them both. They kind of go together. You know, hot dogs and buns. I think I'm going to eat a salad now.